Those rainy days really cater to what I like to do best: lazing around the house in comfortable clothes, reading, watching tv, and cooking something sumptuous all in the warm comfort of my own home. It’s ok that you’re not being productive – it’s gross out. Top that weather off with a headache and runny nose and you don’t even have to get out of bed. That’s what happened to me on Tuesday; I left work early with what felt like the beginnings of a cold. 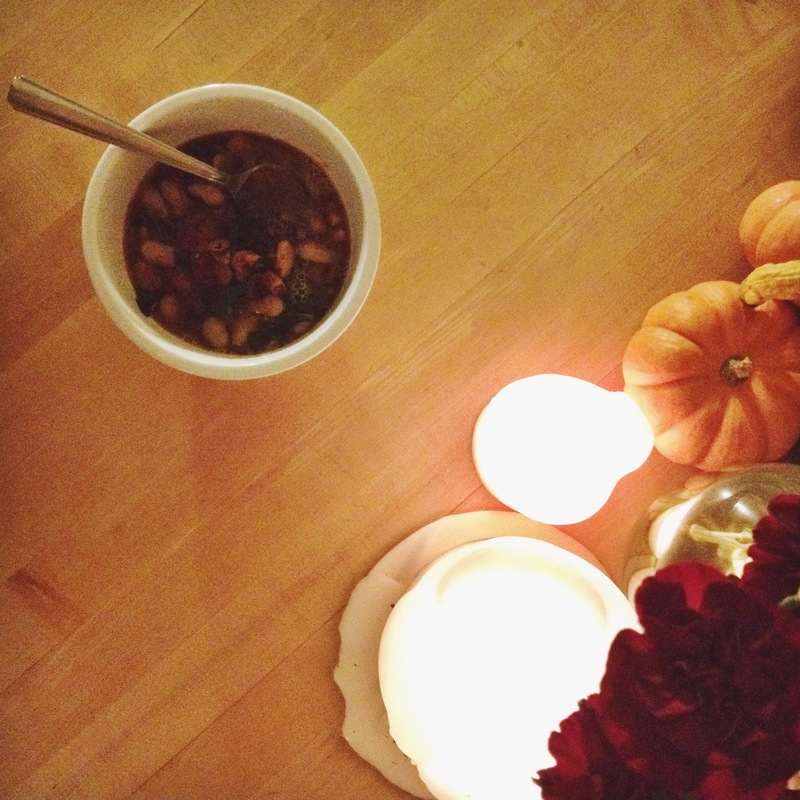 I could have ignored the headache and fatigue, but when I saw my glassy eyes staring back at me in the bathroom mirror, I knew it was time to take myself home for some restorative sleep and soup. The thing about living on your own though, is that you have nobody to coddle nurse you. 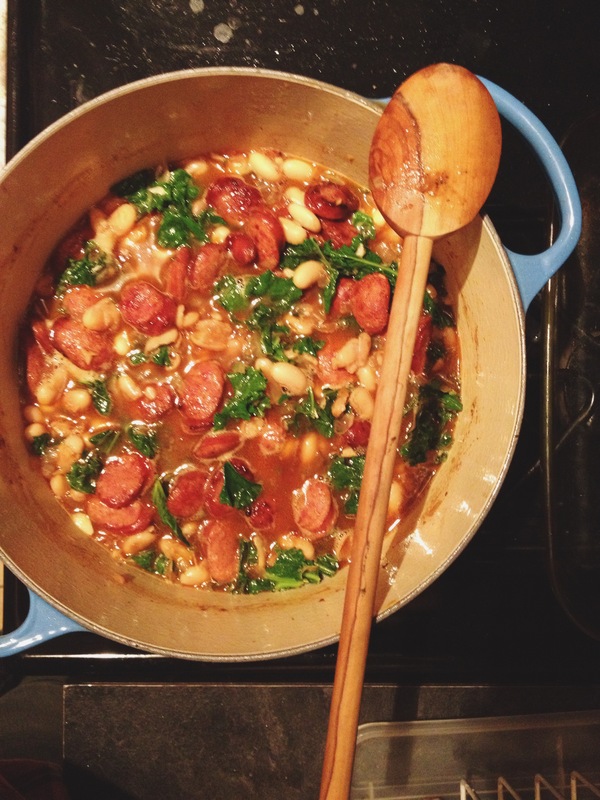 After several hours of lying in bed (read: watching four episodes of Gilmore Girls), I summoned the energy to walk a block to the grocery store and buy the necessary ingredients for this chorizo and white bean stew. This is a really simple, quick stew due in part to the short ingredient list of mostly “pantry staples.” If you’re like me though, and you still need to buy pretty much every ingredient except olive oil because your pantry is poorly stocked, it’s still manageable. 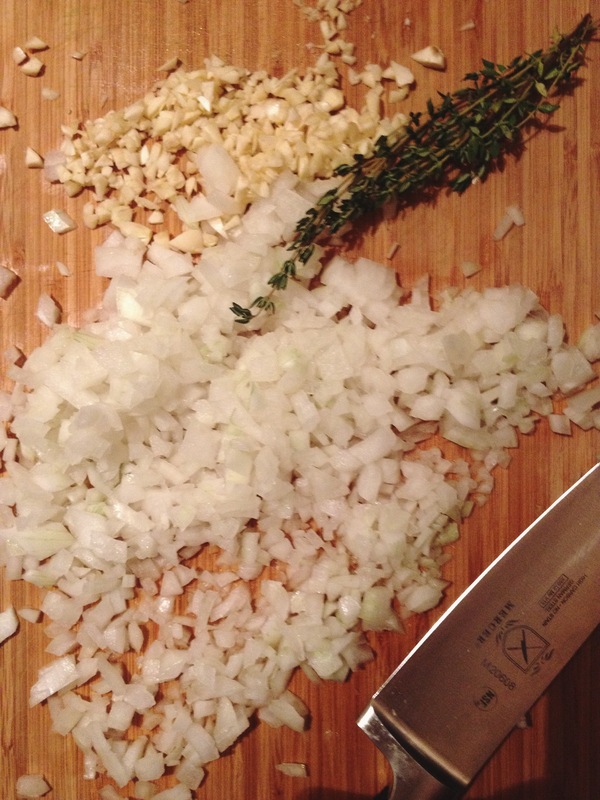 Once you have everything, it’s just a chop, dump, pour, stir kinda deal – minimal effort for maximum effect. Perfect for when you’re feeling weak and run-down but still really want to nourish yourself while simultaneously welcoming true fall weather. I barely tweaked this recipe. All I did was use kale instead of spinach. Not because Tuesday was National Kale Day (mark that on your calendars for next year, y’all! ), but because I had some on hand and I like the sturdier texture of kale better than wilted spinach. You can use any kind of sausage you like. 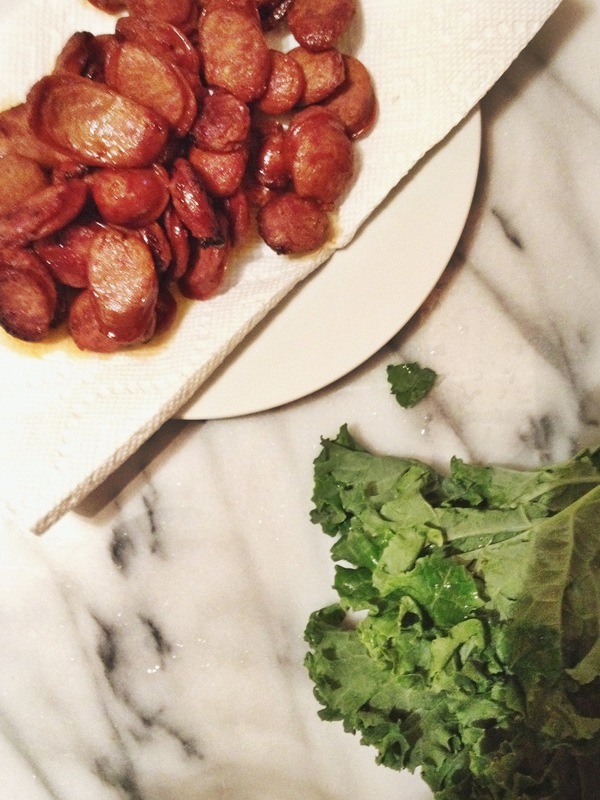 I looooove chorizo, but next time I might try Italian sausage because the whole stew seems kind of Tuscan to begin with, right? Other than that, this is a solid recipe. Watch out, Hale & Hearty: I’m comin’ for ya. Heat 1 tablespoon of oil in a Dutch oven over medium heat. Add the sausages. Turn occasionally, until browned and cooked through, about 6-8 minutes. Transfer sausage to a plate lined with paper towel. If needed, add a little more oil to the pot. 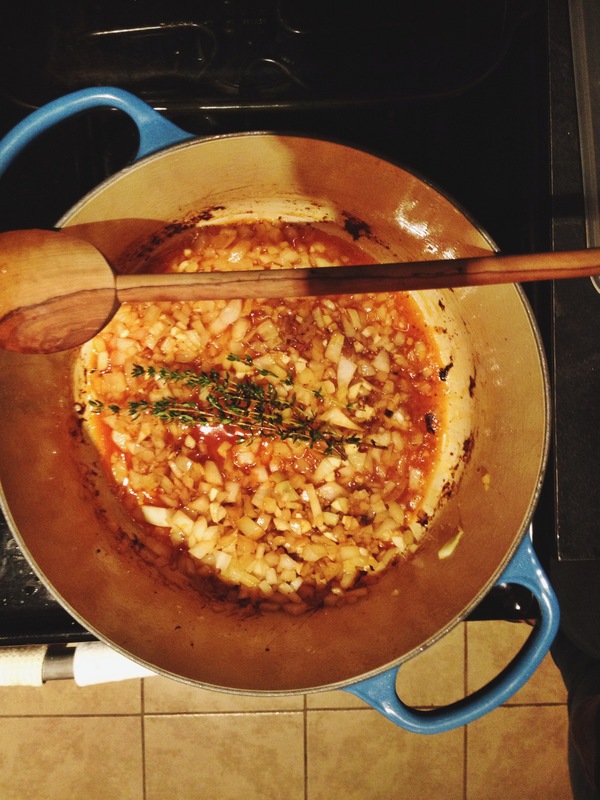 Add onion, garlic, and thyme sprig. Cook, stirring occasionally, until onion is softened, about 8 minutes. Remove the thyme sprig. Add beans and stock and cook, crushing a few beans with the back of your spoon to thicken the sauce. Cook for about 8-10 minutes, until the sauce has thickened slightly. Season with salt and pepper, and then add kale. Cook just until slightly wilted, about 2 minutes. Transfer the chorizo back into the stew. Give it a stir. Serve with a drizzle of olive oil and a pinch of paprika, if desired.